Stomatitis in cats is a health painful condition. Even though experts are not sure about its causes, a few factors commonly appear. Dental disease or periodontitis may contribute to stomatitis in cats. Cats that suffer from a certain immune disease such as feline leukemia virus (FeLV), feline immunodeficiency virus (FIV), and bartonellosis, may get stomatitis. The third factor might be viruses that attack feline defense system. In case of stomatitis, we need to be aware that affected cat goes through extremely painful condition and may have difficulty to eat. In the most severe cases, cats refuse to eat completely and this condition needs immediate veterinarian action. However, it need not be that bad. 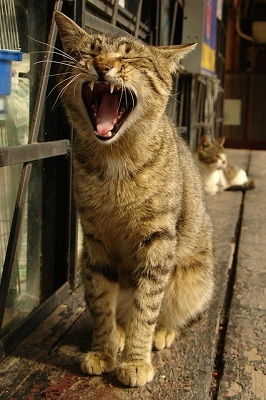 We can do a lot to help a cat in early stages of stomatitis and prevent the worst case scenario. For that reason, veterinarians recommend doing at home exams. But, to do so, we should start with early age to help a cat adjust better. To learn more about ‘at home’ exams and prevent stomatitis in cats, the article “How to Perform an at Home Wellness Exam on Your Pet” gives us the following suggestion. First check the nose for debris and take note of whether it is wet or dry. Your pet’s nose will not always be wet, it will typically vary from moist to dry throughout the day, depending on your pet’s body temperature, activity level and hydration. Then, take a look to see whether there is abnormal eye discharge. Again, you will likely know what is normal for your pet. For instance if your cat or dog never gets eye discharge and suddenly has it, it’s a sign that there could be a problem. Next check whether your pet’s pupils are symmetrical and look at the whites of their eyes. Red sclera (the part of the eye that is normally white) could mean inflammation of the eyes. If your pet is not accustomed to having its mouth examined, slowly acclimate your pet to facial massages so that you can eventually check their mouth, gums and teeth. When you can, check inside their mouth for lesions, swelling, and bad breath. Their gums should be pink, their teeth free of tartar and plaque, their tongue clear and the roof of their mouth clean and free from debris. Next, check the jaw line to see if it feels normal. Check the ears for debris, odor and cleanliness. Brush back the hair and look at the skin and coat. Check for excessive flakiness, lumps and bumps on the sides of the spinal cord, and evaluate muscle tone and weight. If you feel your pet is carrying extra weight I recommend addressing it by increasing activity and feeding a species-appropriate diet (a meat-based, carb-free living food diet). If we are still not quite certain whether a cat has stomatitis, symptoms such as lethargy, depression, irritation, and aggression may appear. Cats who suffer from this serious condition may experience weight loss and dehydration. The most common sign of the disease occurs in a cat running to a bowl when we try to feed it and then rejects it. Feline experts believe that many cats might develop the disease, but certain breeds are more susceptible to this condition. Persian cats, Himalayans, and Somalis are the most prone to stomatitis in cats, but it is not rare that domestic cats get it.